This savoury twist on a classic martini is just right with porcini croquettes. 1. For the truffle vermouth, finely chop the truffle and add directly to the dry vermouth. Pour into a cool, sterilised bottle and store in the fridge to infuse for at least 6 hours (or up to 2 weeks ahead). 2. For each serving, strain 15ml vermouth into a cocktail shaker filled with ice cubes. Add 50ml gin and stir. 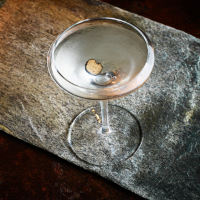 Strain into a chilled coupette glass and garnish with a slice of truffle.